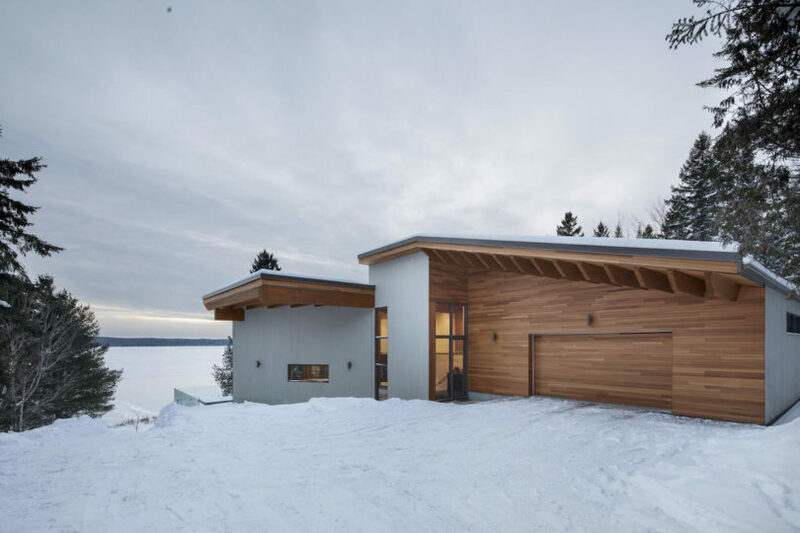 Résidence L’Accostée is a minimalist residence located in Lake Saint Francis, Canada, designed by Bourgeois / Lechasseur. The residence is situated on complicated topography, with the building delicately sloping along the site. The clients, with their expanding family, wanted to preserve their original home and take advantage of the vast free space along the edge of the lake. The frontage is mostly bare to maintain privacy, while the back of the home consists entirely of large glazings. The part of the home closest to the lake is three-stories and reveals a facade articulated by angles and large openings. The clients generally have people over to their home, and wanted a large kitchen and dining space that would accommodate their gatherings.